Something familiar, something peculiar, something for everyone . . . I was remiss in leaving this weekend’s Los Angeles Chamber Orchestra concerts off my previous post of less-publicized upcoming concerts. Jeffrey Kahane and crew will be doing the Beethoven 3rd Symphony (“Eroica”) along with the Dvořák Nocturne in B major. Adding to the fun will be Canadian soprano Karina Gauvin performing two works by Britten: Les Illuminations and Now sleeps the crimson petal (audio samples of her singing each of them HERE and HERE). I’ll admit that I’m not very familiar with her work, but based on the two samples, I’m rather bummed out that I won’t be able to see her perform (plus seeing LACO is always a treat regardless of the program). I will definitely have to make a point of trying to catch Ms. Gauvin the next time she’s in town. If you aren’t already occupied, consider making it out to the Alex Theatre on Saturday night or Royce Hall on Sunday evening to catch one of these concerts. A brief article in The New York Times (literally filed by the paper under “Arts, Briefly”) a few days ago caught my eye: the musicians of the New York Philharmonic have voted to authorize a strike. Despite the potentially grave implications of this, there is shockingly little buzz about it (try googling “New York Philharmonic Strike” and see what you get). The tone of the article was certainly cautious without being alarming. And though the previous contract had expired in September, the musicians continue to perform — apparently, a common practice. Compared to an article about a 1991 NY Phil strike vote, few details have so far come out as to what the points of contention exactly are. In the wake of all the bad press surrounding other big orchestras in Detroit and Philadelphia having their own labor issues, I guess that this is a good thing. Interesting to note that the Managing Director of the New York Philharmonic 20 years ago was Deborah Borda, current President of the Los Angeles Philharmonic. It is amazing and gratifying to think that the LA Phil hasn’t had significant labor strife in decades, and Ms. Borda’s move to the West Coast hasn’t changed that. Bassist Peter Rofé, chair of the negotiating committee, once told me that he could sit down with former LA Phil guru, Ernest Fleischmann, and have an honest and straightforward conversation. Ms. Borda seems to have maintained the productive relationship with the players, and certainly, the latest labor agreement between the musicians and administration valid through 2013 is indicative of continued give and take: the LA Phil players are still the highest paid among their peers with a base salary of nearly $150,000/year at the end of the term; at the same time, they were willing to make concessions such as paying more for their health insurance deductibles and co-pays, something most working Americans can easily relate to. A standing ovation and loud bravos (bravi?) to everyone involved in keeping working conditions smooth with the local band so they can concentrate on making great music, much to the benefit of all of us. And best of luck to the folks in New York — hope there is no interruption to the music making there. As to their influences, some are to be expected (Messers. Borge and Bach, Dudley Moore, Danny Kaye), others a little less so: Matt Stone and Trey Parker and . . . Glenn Gould?? Their concert at The Broad Stage this weekend is already sold out, and based on the video below, I’m not that surprised. If you still want to catch them before they leave LA County, they play another show at the Carpenter Center on Sunday. 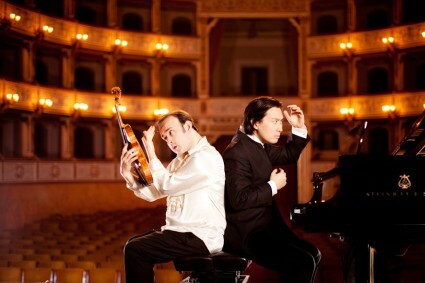 Tags: Igudesman and Joo, Karina Gauvin, New York Philharmonic. Bookmark the permalink.